At the heart of the debate over the origin of life is this question: How can life with such amazing complexity have come to be? What really brought this question home to me came about when I found a series of videos on YouTube showing computer-generated animation of the internal functions of cells. I was particularly struck by one video that demonstrates how genetic information is transcribed from DNA. It showed a series of molecules working together to produce the building blocks of life. Missing from the video was an explanation for how all these atoms were able to come together at the right time to perform the task. I wasn’t watching some Looney Tunes cartoon where inanimate objects are given the ability to think and move on their own—all the components of a cell move by random chance—so it’s not possible for molecules to move around like workers on a construction site. It is amazing to me how the complexity of a living human can come from a strain of DNA that contains data equal to just 750 megabytes. Just to take a picture of all the nervous, pulmonary, circulatory, digestive and cellular systems in the body, one would use up terabytes of data. Evolution must be a master of data compression to also find room for blueprints of the thousands of proteins, antibodies, enzymes, and hormones. The code cannot be packed too tightly; one mistake would produce a fatal error. In fact, our DNA code is based on a loose translation of its genetic data. When the DNA chains are copied, there are always small mutations in the transcribing process. These mutations don’t normally result in disease or complications because life has the ability to work around these changes. One of the latest trends in technology is 3D printing. This is when a three-dimensional solid object is printed from a digital model. Just to print something like a simple solid block would require dozens of megabytes of input code to perform the task. To produce an object of minor complexity would require terabytes of data. With only 375 megabytes to work with from the human DNA, a 3D printer would only be able to print a very rough draft of a hand or foot. In each of our cells are six feet of DNA. This is an incredible length for something that is only two nanometers wide, which gives you an idea of how long this is in compared to the size of DNA. If the DNA chain was the width of your finger, the chain of DNA in your cell would be 114 miles long. To help manage this massive genetic code, our cells package its DNA into strains that resemble rope. Every video I’ve ever seen of the transcription of DNA data into the end production protein has always shown the correct carrier molecules entering the ribosome. Since there are as many as 21 different amino acids, the vast majority of the time the wrong carrier molecules will try to add its amino acids to the chain. Overcoming this obstacle with random chance is just the beginning. Once the protein is formed, it needs to go out and find the other proteins that it was designed to match up with. Some functions in the cell are made up as many as 100 proteins. It is hard to imagine how they could find each by blind luck. When amino acids are created in a laboratory, half of them will be “left-handed” molecules and the other half will form “right-handed” molecules. The difference between them is the mirror-symmetry between their three-dimensional structures, which is similar to that of a person’s right and left hands. All living things on earth only use “left-handed” amino acids. This preference for left over right baffles evolutionists because it shows life taking a more difficult path for no logical reason. One of the most complicated tasks in biology is the process of cellular division. The human body experiences about 10,000 trillion cell divisions in a lifetime. At the heart of the process is the splitting-up of our 23 pairs of chromosomes. Molecular machines called a kinetochore, will attach to each chromosome and link to a network of microtubules used to pull apart each chromosome. One of the most amazing things about viruses is how they can be so deadly, using such a small amount of genetic data. Most viruses have coding equal to two kilobytes and yet they stump medical science by their ability to evade detection by the immune system, invade cells, make millions of codes of themselves, and cause various diseases. We’ve been fighting the AIDS virus since it was discovered in 1981, and we still have no way to eradicate it from the human body. We make the chemical world a master with the creation of billions of compounds, and still, we are unable to create one that will stop a virus in its tracks. The so-called cures we have for polio, measles, and certain types of influenza rely on methods that trigger our immune system to create antibodies. Hardly a week goes by where I don’t cut myself in some small way. When blood is drawn, the bleeding is stopped a by a clotting process that involves at least a dozen major proteins. When a breach in a blood vessel occurs, the platelets somehow realize this has taken place, and they stick to the damaged tissues surrounding the cut. A fibrous web is then built up by a complex series of chemical reactions. There needs to be a tremendous amount of precision in this process. If clotting is too slow, we could easily bleed to death. If a clot forms too easily, fatality could come from whole blood vessels being blocked. Once the damage is repaired, the blood clot needs to be dissolved with an equal amount of precision. If the clot was simply allowed to fragment, deadly obstructions could form in vital areas like the smaller arteries of the heart or brain. 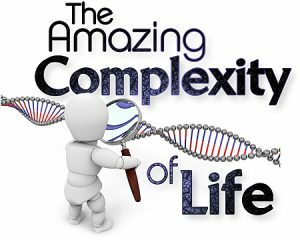 Any discussion on the complexity of life needs to address the mystery of consciousness, the simple ability to know that we exist. When we look in a mirror, we can say, “Hey, that’s me.” At one time, most scientists viewed consciousness with disinterest. They saw it as a subjective phenomenon that could not be properly studied using objective methods. Researchers now realize that consciousness is a profound puzzle that has been given its own field of study. It was perhaps the field of artificial intelligence that forced scientists to acknowledge the unique nature of consciousness. Computers have become vastly powerful in their ability to crunch numbers, but we are still striving to design one that can think for itself. Some computers can answer basic questions, but they do this by just spitting out preprogrammed answers. A supercomputer can beat a chess master, but it does this by brute force, calculating billions of possible moves and selecting the best ones based on pure math. If you enter a computer in a game that involves strategy or value judgments, it will fail miserably. The only way I can account for so much complexity in life is a connection that leads back to the Creator. The DNA code in our cells is only part of the process. I see the instruction in our genes working together with what I would call: The God Apparatus—an unseen function that guides and directs all aspects of biological life. “All things were made by him; and without him was not anything made that was made. In him was life; and the life was the light of men” (John 1:1-4). I would compare this process to a device that contains a movie. A digital optical disc (DVD or blue ray disk) is the most common way we store digital audio data. Each disk contains billions of bits of code, but it cannot run a movie by itself. To bring the information to life, you need to place it into a DVD player that has technology which scans the code, translates it to graphic images and sound, and then sends it to a monitor and speakers. I’m not going to hold my breath, waiting for science to realize that God has a direct link to the process of life. Researchers reject God’s involvement because atheism is built into the foundation of modern science. The complexity of life has no meaning to men who insist on relying on their own intellect. The Bible repeatedly warns against trusting in the flesh for all wisdom. “Let no man deceive himself. If any man among you seemeth to be wise in this world, let him become a fool, that he may be wise. For the wisdom of this world is foolishness with God. For it is written, He taketh the wise in their own craftiness” (1 Corinthians 3:18-19).